How to play avi files on my iPad Air? I have some problems when enjoying AVI on iPad Air: some avi files playback without sound, some avi files even can’t be recognized. There are a number of apps in the store that say that they support AVI files e.g. 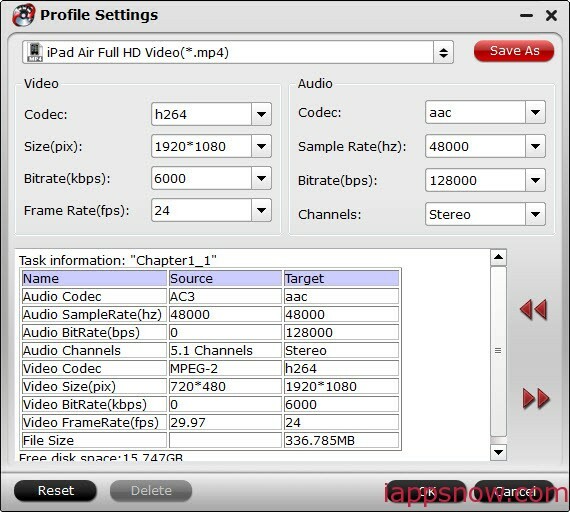 AVPlayerHD, Media Player HD Pro, MoliPlayer For iPad etc. Which one should I choose? Or any easier way? In fact, iPad Air supports AVI files that are compatible with the Motion JPEG standards. However, the most used DivX and XviD AVI movies are not supported. How to resolve the AVI incompatibility issue for your iPad Air? To import Xvid/Divx AVI video to iPad Air for playback anywhere anytime, all you need is a smart iPad Air video converter, called Pavtube Video Converter Ultimate/iMedia Converter for Mac. This software can not only help you convert AVI to iPad Air compatible format with awesome video quality but also let your Xvid/Divx AVI to iPad Air conversion finish within a second. You will also thumb up for its wide support of video input and output formats which is able to convert not only AVI, but also other videos like MKV, MTS, FLV, VOB, WMV, etc to iPad Air and make them playable on any other platform with ease. Below is the step-by-step guide on how to play AVI on iPad Air’s high-resolution screen. Step 1. Install and launch the best AVI to iPad Air Converter for Win/Mac, and then click “Add Video” or just drag and drop to import your source AVI materials. Step 2. Hit the menu bar of “Format”, choose “iPad” category and find the optimal video format for iPad Air. Here “iPad > iPad Air Full HD Video(*.mp4)” is recommeded. You can also choose MOV, MP4, M4V format from “Common Video” for iTunes syncing. Most folks are looking forward to the best format setting for iPad Air. You can customize the parameters via clicking the Settings icon on the main interface. Step 4. Press the “Convert” button, begin to convert Xvid/Divx avi videos to iPad Air supported video. Once the process completes, locate the files and sync the converted MP4 videos to your iPad Air via iTunes. In this way, you can effortlessly watch Xvid/Divx AVI video files on iPad Air without any incompatible issues. With this ultimate converter, Blu-ray, DVD and ISO files can also be converted into iPad Air playable videos.